No single food is more quintessentially Calgarian than a perfectly grilled slab of steak. The Porterhouse Project at Open Range, a 24-oz. piece of Alberta beef for two served with chimichurri sauce. While there are many restaurants in town that have steak on the menu, there’s nothing like diving into the full experience at a proper meat ‘n’ potatoes steak house. 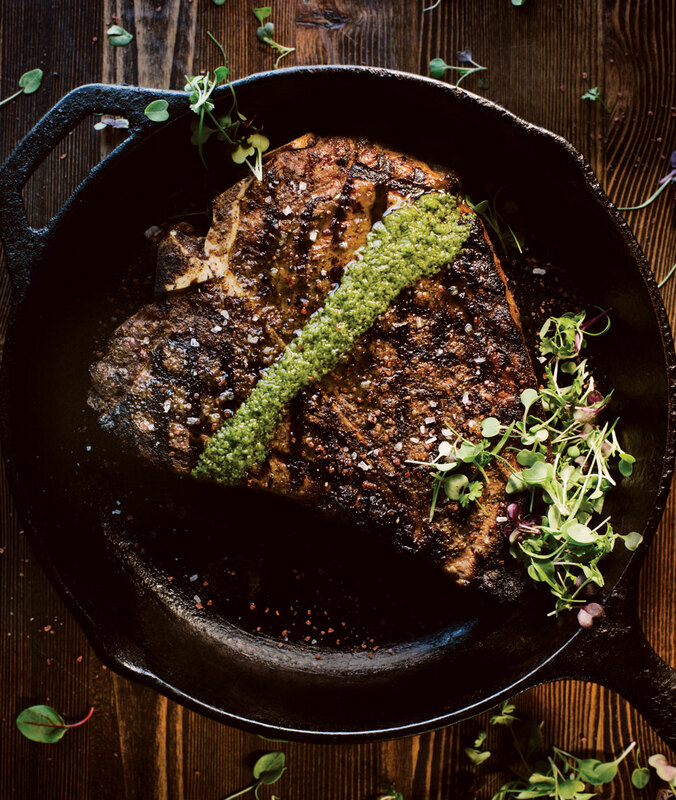 From the tried and true that have served as de facto offices for oil and gas execs in decades past to bright and modern epicurean destinations specializing in locally raised beef, here are some of the city’s best when it comes to finding a really, really great steak. 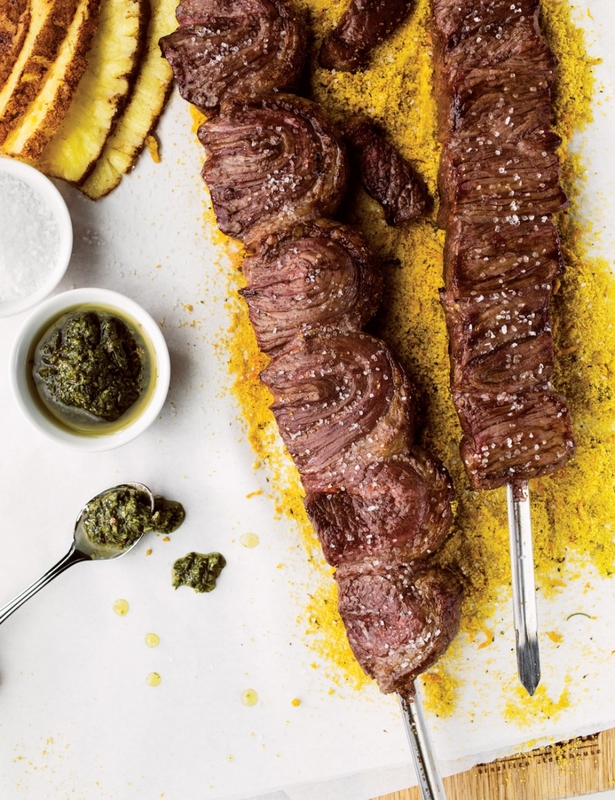 The first of Calgary’s several Brazilian-style steak houses, Bolero opened in 2007 and introduced locals to all-you-can-eat tableside skewer service. Offering 16 different meat selections, all cooked over charcoal, Bolero’s Alberta-raised steak selections include the popular duo of top (Picanha) and bottom (Fraldinha) sirloin. With a cold salad bar and a hot side bar (with mashed potatoes and stew) to complement, be prepared to leave with a satisfying case of the meat sweats. Insider’s tip: If you can, save room for dessert. Bolero’s Tres Leche cake is so justifiably popular that the restaurant goes through three or four large cakes every night. Located in the Sheraton Cavalier, Carver’s is a step above your typical near-the-airport hotel restaurant. 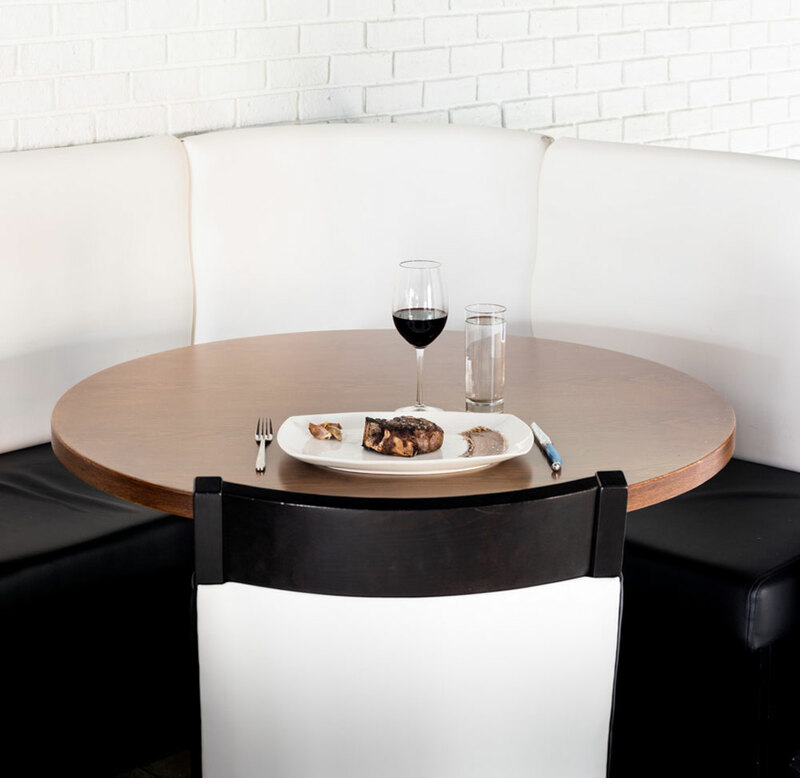 With big banquettes and a stylish design, the room is modern, but still suitably “steak house-y.” All the beef is Canada AAA and hand cut, and you can spice things up with a side of the restaurant’s Wicked Whiskey BBQ sauce. Insider’s tip: Steakhouse What goes better with steak than bourbon? Carver’s offers a three-piece bourbon-tasting flight. With a casually upscale, yet family-friendly vibe, Cattle Baron’s sterling silver beef selections and urban-rural mix decor makes it an ideal place to bring visitors for an authentic Alberta steak experience. The prices tend to be a little lower than downtown steak houses, but the quality of the above-AAA hand-cut Alberta beefis upscale all the way. Insider’s tip: Cattle Baron has a surprisingly solid wine list, with lots of entry-level selections, as well as some intriguing higher-end choices. Celebrating its 10th year last year (with a newer sister in Canmore of the same name), Gaucho offers stews, salads and other vegetable dishes, but the overwhelming emphasis is on sumptuous, flavourful meat, especially top sirloin (Alcatra) and rump steak (Picanha), sliced off big skewers tableside until you simply can’t eat any more. Insider’s tip: Brazilian barbecue to go? Yes, please. Call ahead or stop in, for two or up to four people. The Calgary outpost of Hy’s reopened last year in The Core, though the room pays homage to the original restaurant, which opened in 1955. Upscale, with a hefty dose of retro charm, the plushy booths and tableside service are all class. Treat yourself to the chateaubriand for two, carved tableside, or, if you want to capture the attention of the rest of the restaurant, the Steak Diane, flambed right at your table. Insider’s tip: The cheese bread (which is exactly like you remember it from the old location) is almost as good as the steak. A business lunch mainstay since 1972 (and still owned by its founding families), Caesars’ dark leather and wood decor is a nostalgic plus (the Willow Park location offers a slightly updated atmosphere). Classic steak house perks like tableside preparations, blue cheese wedge salads, and Emperor-sized martinis make for a Mad Men-esque experience. Insider’s tip: Longtime Calgarians can specifically reserve their father or grandfather’s “table” for special occasions or milestone business meetings. The Keg is such a well-loved standard in Western Canada that it’s easy to take it for granted, but, for a chain, it sure does make a tasty (and relatively affordable) steak. Family-friendly, always consistent and with convenient locations throughout the city, the restaurant never steers you wrong with a big New York strip or slab of prime rib with a baked potato on the side. Insider’s tip: For summer, all Calgary Keg locations will be pouring 12 seasonal cocktails, including a blackcurrant ginger martini and a New York sour that combines whisky, lemon and lime, simple syrup and a red wine float. Ben’s Beef Picture Butte Alberta 12-oz. bone-in filet from Modern Steak. A contemporary take on a traditional steakhouse, Modern Steak is serious about its beef but goes for a lighter, brighter interior, current music and updated versions of classic side dishes. The emphasis is on a hyper-local, top-quality beef program: Modern Steak’s beef is all Alberta-bred and ranch-specific, with dry-aged, wet-aged and grass- or grain-fed options. Education is also key to the concept – servers will walk guests through the menu to help choose an ideal cut. Insider’s tip: The crown jewel of Modern Steak’s menu is the 36-oz. 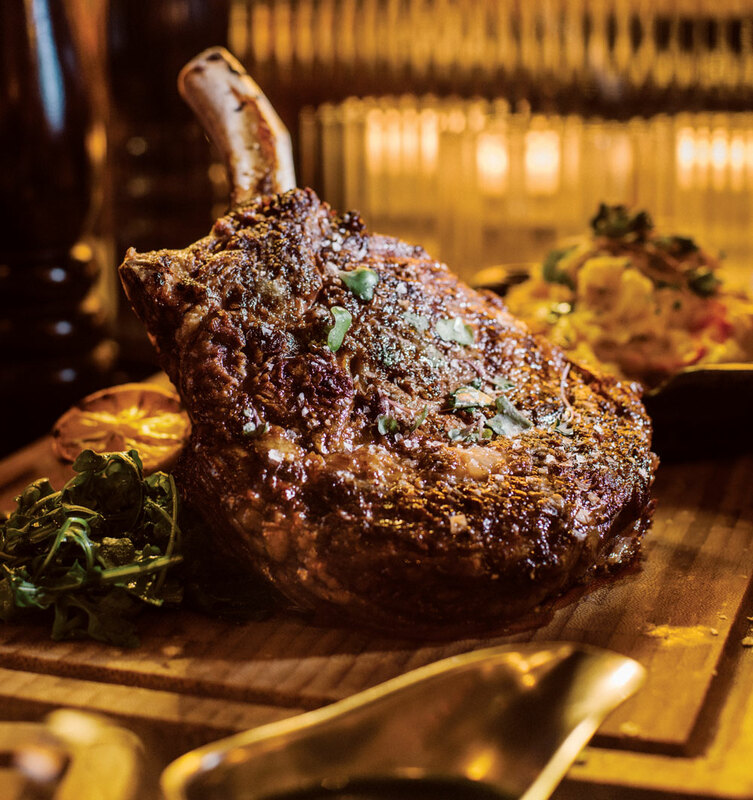 bone-in Tomahawk, a glorious 40-day dry-aged piece of meat portioned to be shared by two. With its cowboy decor (think wagon wheels, rustic wood touches and a little bit of taxidermy) and Southwestern flavours on the menu, Open Range goes beyond the typical slab o’ meat-and-baked potato steak house. The beef is fantastic (try the juniper crusted bone-in rib chop), but the chef also offers gamier takes on steak house fare with an elk rib-eye and a bison flank steak served with creative and savoury sides. Insider tip: If beef is what you’re after, go for The Porterhouse Project, a 24-oz. piece of Alberta beef for two served with chimichurri sauce and Sylvan Star gouda scalloped potatoes. Pampa Brazilian Steakhouse Joao Dachery’s AAA Alberta rump with chimichurri and Farofa de Dende. By now, most people are familiar with the concept of a Brazilian steak house: diners pay a set price and waiters buzz around the dining room with skewers of barbecued meat, carving portions directly onto guests’ plates. Pampa is one of the city’s best versions of this concept – chef Joao Dachery’s AAA Alberta rump steak is worth turning down some of the other skewers for. The sides at the salad bar are worth saving room for, too – especially the pickled watermelon rind. Insider’s tip: Be sure to cap your meal with a taste of Licor 43,a Spanish digestif poured from dramatic heights for a little after-dinner theatre. The Calgary franchise of this big steak house chain (locatedon the second floor of the Calgary Tower) is locally owned and operated and serves only USDA Prime and Alberta Prime beef, which is basically the best of the best. Ruth’s Chris famously cooks all of its steaks on an 1,800F double broiler, an ultra-quick cooking method that locks in the juices and flavour, since the steaks cook on both sides at the same time. Saltlik’s downtown location makes it a go-to for meaty business meetings, but, thanks to the comfortable atmosphere of the dining room, the restaurant has become a destination for anyone looking for a nice steak, without a lot of fuss. Pasta mains are available if anyone at the table is in the mood for something different (including a Kobe-style fettuccine and meatballs). Insider’s tip: The sirloin cuts at Saltlik are all CAB (Certified Angus Beef), putting them in the top two-per cent grade of North American beef. Order it straight up or with a house-made barbecue sauce. A slightly more relaxed version of old-school steak house charm, with its red velvet-backed chairs and open fireplace, Smuggler’s is a favourite of many long-time Calgarians. The prime rib (slow roasted on the bone) is a house specialty, available in an “Owners & Friends” cut for the truly hungry, and the filets and New York strips are presented in classic steak house style. Insider’s tip: At Smuggler’s, you’ll find an increasingly rare steak house sight: a fresh salad bar, which is included with all of the restaurant’s dinner entrees. Vintage Chophouse 32-oz. bone-in prime rib chop. 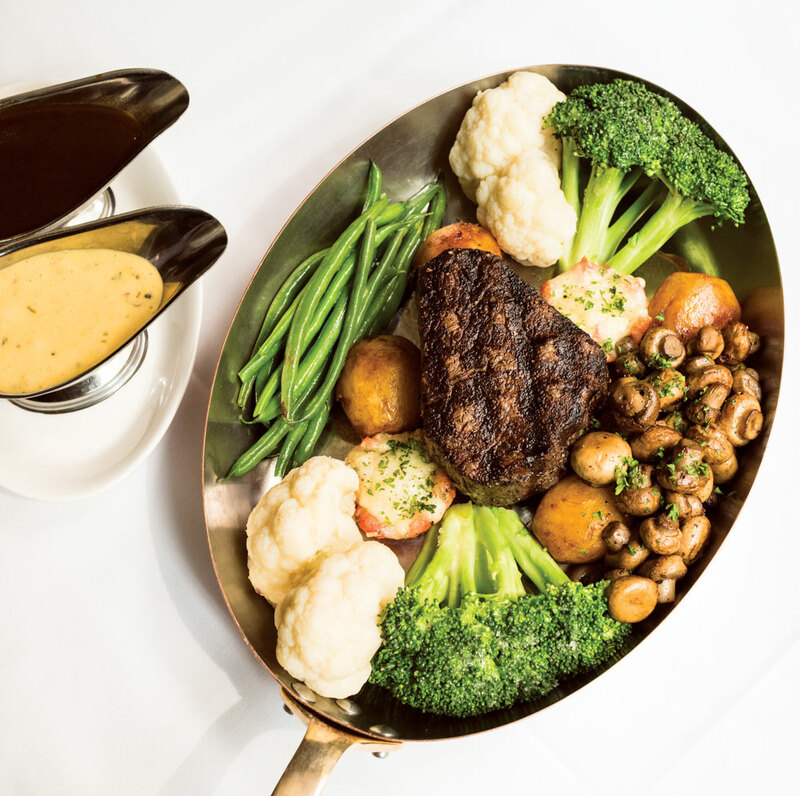 Representing the ideal balance between classic steak house and contemporary cool (the decor is dark, but not imposing), the meat takes centre stage here, with top Canadian cuts ranging from a 32-oz. bone-in prime rib chop to a mouth-watering CAB (Certified Angus Beef) tenderloin. The dining room is appropriately posh for a place with an award-winning wine list of 300 selections. For a more casual experience, duck into the tavern for upscale bar bites and live music on Fridays and Saturdays. Insider’s tip: The steaks are among the best you’ll find in town, but don’t forget about Vintage’s sides and sauces. Add the lobster mashed potatoes and a near-perfect Bearnaise to up the ante. A mainstay of fine steak house dining since 1979, this restaurant pays homage to a time when people “dressed for dinner” and professional dining-room staff executed formal service with aplomb. Steaks are expertly trimmed and aged in-house, and cooked to perfection. Since you have to choose, go for the beef Wellington, the star of the show. Insider’s tip: If you like a little drama with your dessert, order the cherries jubilee. It’s flambed tableside, a little boozy and served over vanilla ice cream. 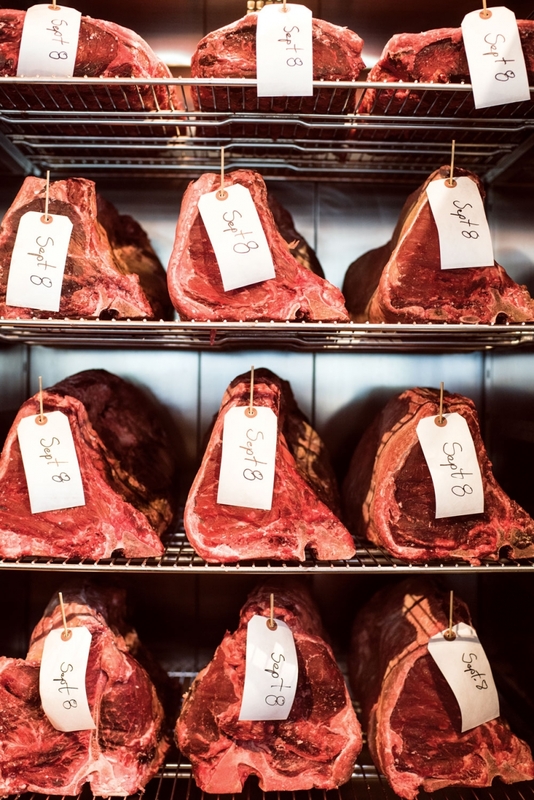 While Charbar isn’t a steak house in the traditional sense, the restaurant cooks up a mean steak on its Argentine wood-fired grill and is also experimenting with extreme dry-aging methods. As the water in the uncooked meat evaporates, the flavour becomes more intense and the texture more tender. Cuts like the two-pound porterhouse and the 7K Ranch longhorn butcher cuts are aged anywhere from 70 to 200 days (the latter being an extreme case), pushing the boundaries of what we typically think of when it comes to Alberta beef.